A delegation of UE officers, leaders and staff joined UE’s Canadian partner union Unifor for their Canadian Council meeting from August 17-19 in Halifax, Nova Scotia. “They were very welcoming and continued to display the kinds of progressive political and trade-union principles that are fully in sync with the UE,” said UE Director of Organization Gene Elk. The Council meeting celebrated Unifor’s militance in strikes at the Port Arthur Health Centre in Thunder Bay and the world’s largest salt mine in Goderich (both in Ontario). In both of these struggles, mass mobilizations of Unifor activists stopped scabs from getting into the workplace and forced intransigent employers back to the bargaining table. Members of Unifor Local 16-O in Goderich barricaded the mine for 12 days and when the last scabs were marched out of the workplace by union members and Dias, no replacement workers ever got back in. “To stand shoulder to shoulder next to our National President and walk those scabs off this property was the proudest day of my life,” said Gary Lynch, President of Local 16-O, holding back tears. Members of Unifor Local 229 from the Port Arthur Health Centre presented Dias with a piece of chain from a fence that had surrounded the center the previous week. Unifor members from across Canada helped the 65 women of Local 229 shut down the clinic, until the doctors who owned it returned to the table. Their new collective agreement was signed on Wednesday, August 15, just two days before the Canadian Council opened. “We shut them down, we’re making history here,” said Gina Nuttal, Local 229 member, in a video played at Canadian Council that left many members present in tears. Unifor is looking to bring this stepped-up militance to the ongoing lock-out at D-J Composites in Gander, Newfoundland, where Unifor Local 597 members have been locked out for more than 600 days as the U.S.-based employer brings in scabs. UE provided solidarity to the D-J Composites workers last December by leafleting their corporate headquarters in Augusta, Kansas. Dr. Danyaal Raza of Canadian Doctors for Medicare addressed the council meeting about the need for a national pharmacare plan, pointing out that more than one million Canadians forgo basic needs to pay for medications. “A broken system leaves my patients and our family members with broken choices,” said Raza. Although Canada covers most healthcare needs through its Medicare single-payer plan, it does not yet extend single-payer coverage to medications. Unifor is helping to lead the fight for universal pharmaceutical coverage. The council meeting also highlighted Unifor’s work of truth and reconciliation with Indigenous communities. “Unifor unites with Indigenous people in the ongoing struggle against intergenerational violence and colonialism,” said Dias, announcing an $80,000 donation to the Mi'Kmaw Friendship Centre at a fundraiser on Saturday night. During the council meeting, UE leaders met with Unifor leaders to continue plans for the North American Solidarity Project conference, which will be held in November at Unifor’s retreat center in Port Elgin, Ontario. The conference will be an opportunity for a larger delegation of UE members to engage in deeper exchange with Unifor, Mexican unions, other progressive U.S. unions, and supportive academics about how to build a stronger and more progressive labor movement in North America. 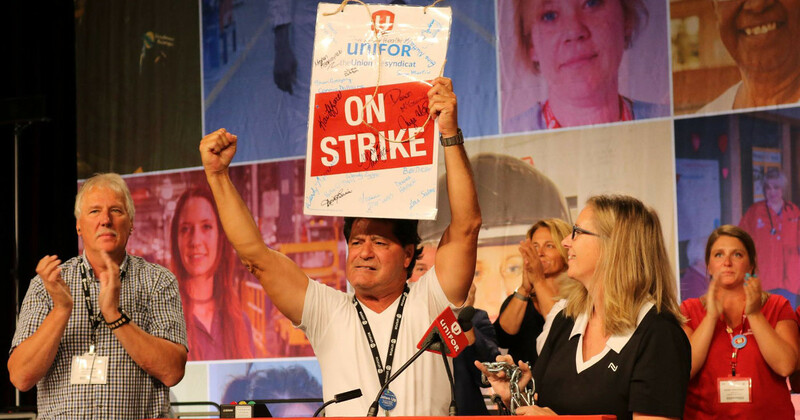 “Unifor’s strength, militancy and solidarity echoes throughout all the work being accomplished there,” said Martinez. “Their beliefs and style of getting things done could not be any closer to who we are as an organization and how we hope to get things done. There was ample debate on the council floor about recommendations and issues, all ending in a vote. UE Secretary-Treasurer Andrew Dinkelaker, Eastern Region President Donna Morgan, General Executive Board member and Local 329 Chief Steward Bud Decker and International Representative Barbara Resnick made up the rest of the delegation. Portions of this article are based on coverage from Unifor’s website, unifor.org.